True to his farmboy roots, Jerry Apps' book about farming and water gets right to the point: it might not be the ideal rainfall coming down, but to a farmer, all rain is revered and not to be cursed. 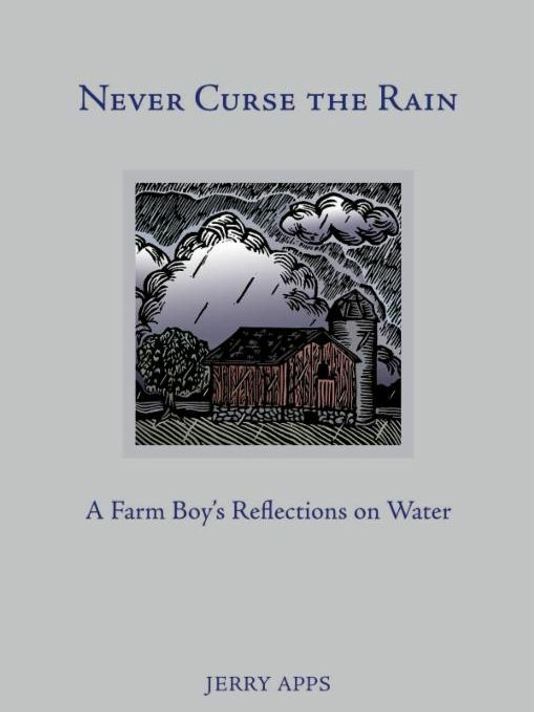 Published by the Wisconsin Historical Society Press, Never Curse the Rain is the third in the Society's series of rural-life memoirs by Jerry Apps. The series includes The Quiet Season: Remembering Country Winters and Whispers & Shadows: A Naturalist's Memoir. All three are companion books to Jerry's popular Wisconsin Public Television documentaries. "Rural life author Jerry Apps shares his memories of water — from its importance to crops and cattle on the farm to its many recreational uses — in his newest book, Never Curse the Rain: A Farm Boy's Reflections on Water. From hauling buckets of water from a windmill pump into the farmhouse to listening to rain pattering on the barn roof on a rainy afternoon, Apps details why he and his brothers learned at young ages to 'never curse the rain.'" "On the small family farm during Apps's Depression Era youth, rain was cause for celebration. Indeed, the family's very livelihood, even survival, depended upon its arrival, as did many of a young boy's pleasures like fishing, canoeing, and 'puddle jumping.' Rain has remained a celebratory touchstone throughout his life, Apps writes, in a variety of ways as a source of recreation, comfort, and creativity."